Was chatting almost all the time at work today. Received 31 e-mails from the past 4 days, got a shock. Too bad I will miss Macik's specially-cooked lunch tomorrow because I will be on half-day leave. While waiting for the late-comer, I had my cup of macademia ice-cream. 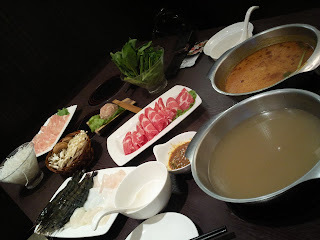 We went to JPot for steamboat dinner. Ordered the Value Dinner for 2, $38++ which included prawns, red groupa slices, sotong slices, scallops, mushroom combinations, spinach, noodles, chicken slices, black pork slices and the ball of pork. Don't be fooled by the little ingredients for they filled our stomachs completely. It's shopping time after dinner. I bought a set of sportwears at Adidas while CSX bought a pair of pants at G2000. Got to claim money for the pants from my mum. Saw an interesting sentence on the bus, 'Pleasure is desire fulfilled'. Back home at 10pm. Eugene sent me this link http://www.youtube.com/watch?v=ymAyA-qjwUk&feature=player_embedded to a touching video. Shows how a male dog continued to stay by his dead partner after being knocked down. Will be having my dental appointment and massage tomorrow.